The album starts off in rumbling fury with this nearly 7 minute track that sends into a trance and never looks back. The song has an up and down feel that reminds me a bit of 'Attack & Release' or 'Magic Potion' tracks. Auerbach clearly jumps into the pain and stress his life has seen by moaning and riffing throughout the track. 'Weight of Love' has an incredible mix of lyrics, guitar solo and enough groove to make this an instant classic Keys song. What a leadoff hitter this is. A 7 minute song to start off a 45 minute album. Only The Black Keys can pull it off. 'In Time' picks up right where 'Weight of Love' leaves off. Almost the same beat starts off the track that the first track ends with and Auerbach goes into his famous falsetto and serenades "You've got a worried mind...I've got a worried heart". Another clear call out to his struggled relationship. Is this a dedication album to his ex-wife? Whatever it is, it makes for fantastic music. 'Turn Blue' shows a psychedelic vibe. 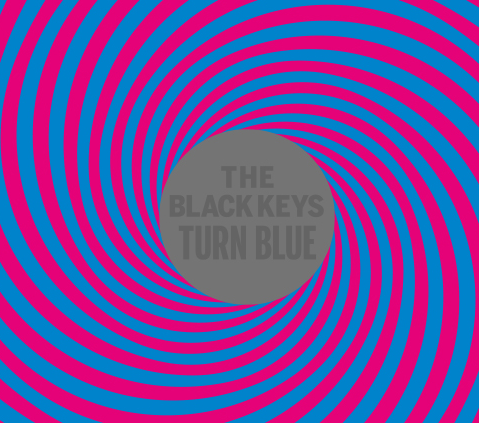 After listening for the fourth or fifth time, I realized The Black Keys have reverted back to the place that they began discover themselves. 'Turn Blue' belongs on the A side of a Steve Miller Band album. It could easily be dropped into 'Book of Dreams' somewhere between 'Jet Airliner' and 'Swingtown' It holds the same complexity and groove that lulls you and moves you and the same time. Its a sit down, chill out and close your eyes type track. 'Fever' picks up right where 'El Camino' left off three years ago with a beat that will be conducive to making arenas across the world bob their heads. It is evident that Dan and Pat took producing instruction from Danger Mouse on the song as it sounds as it fits perfectly into the songs off of their last three hit records, Attack & Release, Brothers and 'Camino. Dan Auerbach's smooth voice glides over the perfectly engineered beats from Danger Mouse and the tag-a-long percussion from Patrick Carney. It also fits well into the body of the album as at this point a bit more pace was needed. Although the lyrics are a bit vanilla, the beat does the job. Another painful and dark track as Auerbach starts with "Why you always wanna love the ones who hurt you? Then break down when they go and desert you..." I hate to say this, but Auerbach's pain is my pleasure as you can hear his heart breaking through every word of this song. Another track that ends perfectly as it slowly tinkers complete, ending side A. Side B picks up where side A leaves off. Another falsetto masterpiece that starts slow, but picks up and cranks off. Starts slow, picks up, hits the chorus and slows then picks up and goes up and down throughout. Another dark track in which Auerbach moans, "Looking back on where we used to be...Everything was clear, still I refuse to see...Hearts began to burst...The diamond turned to dust"
Probably my favorite track on the album. A furious beat and combo of Carney's drums and Auerbach's voice makes this track jump through the speakers. An insane pace to start and then gets drawn out a bit for guitar riffing. Then closer to the end picks up again to make this the next potential single. It has to be, it kills. This is probably the only song I'm on the fence on through the whole album. The falsetto starts off raspy which throws me off. It sounds strained and tried too hard. The beat never picks up as I thought it might. Although I'm not a huge fan, it does fit into the landscape of the album so it gets points there. It just doesn't feel clean enough. This song starts out funky enough and has a combo of normal Auerbach mixed with falsetto Auerbach almost feuding with himself on the mic. I originally thought the song was going to be about his ex-wife getting with 10 different lovers, but he's actually detailing his pain is as strong as if he would have been left by 10 lovers. Pretty deep. A little piano opens the track and the misery continues as Auerbach complains about what was once had and now what is gone. Looking for comfort from friends, but not getting what he needs from anyone. Explaining "The house it burned, but nothing there was mine...We had it all when we were in our prime" as though life has not been normal for a long time. So much discomfort in a groovy track. Probably one of my least favorite tracks beat wise. The last track is oddly upbeat almost as an eff you. As if Auerbach's over it all and done complaining. "I went from San Berdoo to Kalamazoo...Just to get away from you" is his way of saying he's running away from his problems. He hits the blacktop and keeps running and doesn't look back. Almost a perfect sendoff. All in all what a deep and dark and sad album. The beat matches the feel and on sixth or seventh listen I'm drawn to it. I'm not sure where this matches up to their previous LPs. I'd like to say it's pretty high up on my list, but it's just so non-descript. It probably can be dropped behind 'Brothers', 'Rubber Factory', 'Thickfreakness' and 'Attack & Release'. That's saying a lot because those four albums to me are in my top 15-20 albums. It really is a full album, meant to be played start to finish. It tells the story of Auerbach's last couple of years of struggle. It is almost a sin to pull tracks off of this album for singles, because those singles are only chapters in the story.